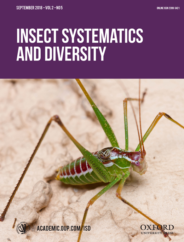 Insect Systematics and Diversity (ISD) publishes original research on systematics, evolution, and biodiversity of insects and related arthropods. The journal welcomes integrative studies incorporating comparative and developmental morphology, conservation, behavior, taxonomy, molecular phylogenetics, paleobiology, natural history, phylogeography, and articles that utilize novel technologies or data types or describe emerging methods of research. Great truths are often so pervasive or in such plain view as to be invisible. This is the case with bees and their food plants, the world’s quarter million flowering plant species, especially because it’s easy to overlook small things in a world in which whales and elephants hold the imagination of the public. Little do most of us know that the more than 20,000 species of wild bees (Hymenoptera: Apoidea: Anthophila) on our planet are working behind the scenes to pollinate most fruit and vegetable crops and wild plants, providing approximately one-third of the food humans consume. We are familiar, of course, with the domesticated honey bee and its large social colonies, and the occasional bumble bee seen in the garden. 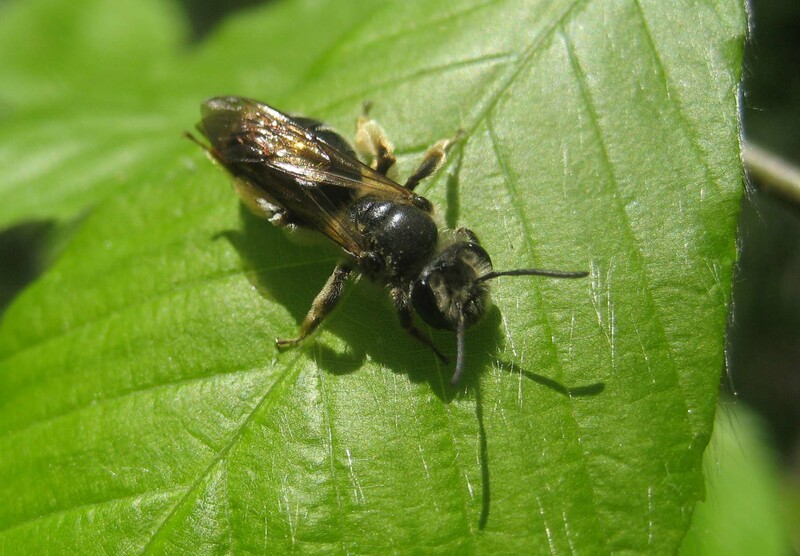 But behind the scenes are thousands of small, solitary bees living in the soil and in the pithy stems of overwintering plants, each of which plays an important role in pollinating much of the world’s flora. Image credit: Bombus affinis by Johanna James. Bees evolved approximately 125 million years ago in a relatively rapid burst of diversification in concert with the flowering plants (Angiosperms), each dependent on the other for survival. Bees and the small subfamily of vespid pollen wasps (Masarinae) are the only group of Hymenoptera (ants, bees, and the stinging wasps) that rely entirely on pollen and nectar for food and reproduction. Solitary bees are integral parts of most ecosystems, from desert to tropical to alpine temperate communities. The major groups of social bees (honey bees, bumble bees and stingless bees) form colonies of hundreds to hundreds of thousands of individuals. These large, behaviorally complex communities have often been compared to human societies with their complex division of labor and dominance structures, sophisticated communication systems for sharing information, remarkable learning capacity and behavioral plasticity that enables them to respond to changes in their environment. The bees, which retain all the diverse levels of sociality, offer a rare view into the evolution of social behavior. Image credit: Andrenidae sp by Jim Whitfield. As humans are changing the earth’s environment at an alarming rate, however, it is impossible for bees to adapt in concert to these changes. 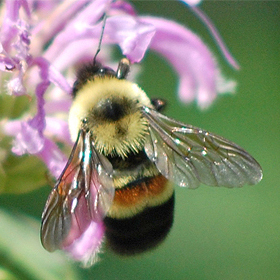 Precipitous declines of bumble bee populations are accompanied by extirpation from whole regions of Europe and parts of South America, and in North America the rusty patched bumble bee (Bombus affinis) is now on the endangered species list and Franklin’s bumble bee (B. franklini) may have become extinct. Causes of these declines are likely to be multifaceted, but minimally include extensive loss of natural food and nesting resources to accommodate the enormous expansion of agricultural production, accompanying use of harmful pesticides, diseases transmitted via domestication and global transport of colonies for crop pollination and climatic warming. Unfortunately, the precautionary principle is not used in the US as it is in Europe, where neonicotinoid pesticides have been banned in lieu of obtaining the critical scientific information required to make credible decisions about their continued use. Commercial interests trump environmental interests in most cases, however, a couple of successes in environmental protection of bees suggests the message is getting through at some level. In the meanwhile, we can all do our part to encourage sustained bee populations by the plants and nesting sites we provide in our own gardens, exchanging pesticides and herbicides for weed-pulling exercise. Featured Image Credit: Bee on Lavander by Alfonso Navarro on Unsplash. Sydney Cameron, PhD, is a professor at the University of Illinois and founding co-editor of the journal Insect Systematics and Diversity. Dr. Cameron is an expert on bee phylogenetics, evolution, genomics, behavior, and conservation. Her lab works at multiple levels in phylogenetics, from higher level to populations, and has developed next-gen sequencing for phylogenetics and analysis of genetic variation and population structure of bumble bees and the pathogen Nosema bombi, including non-destructive use of museum specimens for comparative genetic analysis.